Consolidation is prominent in the banking sector, demonstrated by an accelerated rate of acquisitions over the last few decades. The number of U.S. chartered commercial banks has fallen from 14,250 in 1986, to 8,460 in 2000, to now approximately 4,850 as of January 2018. This was driven by two factors. One factor is the relaxed interstate branching regulations allowing expansion into more markets for single entities. The second is that during the financial crisis a large number of acquisitions occurred. The majority of these acquisitions were underperforming banks with high deposit balances and small loan portfolios. The mergers were predominately small banks buying other small banks, at almost two-thirds over the past decade. In this blog, I discuss the impact mergers have on certain product pricing for financial institutions (FIs). Mergers in banking, like in any industry, have many benefits if decision makers are successful at managing the new opportunities. The combined financial institution is able to achieve economies of scale and promote synergies in communities over a larger region. The merge leads to decreased regulatory, branch and overhead costs. In the past few years, as consumer behavior and needs have changed, technology and services have become more important to current and potential customers. This trend and the merging of banks in the same market, has led to closure of branches and as a result lowers non-interest expenses. The operating cost savings can be returned to consumers in higher deposit rates, or better services for accountholders. Also, risk in the bank network can be decreased by growing business lines and geographic reach. Overall, mergers lead to a more efficient and sounder banking system. Though only one-third of mergers are banks with assets greater than $10 billion, these mergers receive more press due to size of the institutions and consumer fears of being non-competitive. When these large banks increase their market share it tends to lead to increased competition in small business lending and reduced competition for retail deposits, helping and harming these customers respectively. Larger banks (total assets over $10 billion) have the opportunity to offer lower deposit account rates, because of their access to wholesale funds. 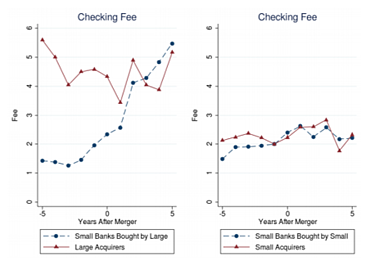 Additionally, when large banks acquire a small bank, account fees quickly are raised, versus when a small bank is acquired by another small bank, as you can see in the image below. When a financial institution is introduced into an unfamiliar and competitive market through a new acquisition, it often prompts the desire for the merged FI to have uniformed pricing across all of their locations. However, it is important that a newly merged FI looks closely at what their competitors are offering in all their markets, and not just base their new fees off the market with the highest pricing structure. Other FIs in the market are often encouraged to reevaluate their own pricing to ensure they stay competitive and are maximizing their revenue opportunities. The U.S. banking sector is still segmented compared to Canadian and European markets and has many opportunities for healthy consolidation for years. Market efficiencies can lead to more competitive pricing, and a continued increase of technology with banking allows consumers to find different options, outside what was accessible to them five years ago. The size of the merging institutions is the main determinant of the extent of product pricing and interest rate changes implemented. Product and service pricing constantly change to adapt to evolving markets and growing financial institutions.